Does this ever happen at your house? Last night we went out to dinner to celebrate the end of a certain large event that we won’t talk about anymore. While enjoying our dinner (which was awesome, by the way.Ã‚Â Mimi’s cafe rocks!Ã‚Â Great service and they let us use gift certificates for ALL FIVE kids’ meals! ), the subject of homework came up, and we learned that two of my children had major assignments that were due the next day. One child said that he was writing a report on Galapagos tortoises, but assured me that had done most of the assignment already, and it was on his flash drive.Ã‚Â Oops–did you mean the flash drive that you currently can’t find?Ã‚Â Good luck with that. The other child was supposed to do a book report on a biography.Ã‚Â She had chosen to read a book about Michelle Kwan.Ã‚Â So, on the way home, I asked that child to tell us all about Michelle Kwan to prepare her brain for the book report she had yet to write.Ã‚Â She told us that Michelle had started skating at age 6, that her inspiration was her hockey playing brother (or maybe it was cousin.Ã‚Â Anyway, someone played hockey), and that she had won some competition when she was 13.Ã‚Â The end.Ã‚Â Hmmm.Ã‚Â “Did she go to the Olympics?”Ã‚Â I asked.Ã‚Â “I don’t know.Ã‚Â I haven’t finished the book” she says.Ã‚Â It’s a good thing it was dark in the car, so she couldn’t see the smoke coming out of my ears. When we got home from our lovely dinner, I assigned the Galapagos writer to work on my computer, and the Michelle Kwan biographer to come and dictate what she wanted to say to me in Dad’s office.Ã‚Â Then the real drama began.Ã‚Â She couldn’t FIND the book on Michelle Kwan, and when pressed, she admitted that she had only read two chapters.Ã‚Â She then decided to do the report on Harry Houdini, since she also had his biography there.Ã‚Â I left her to read and do some research for about a half an hour while I went to go cool down and watch 30 Rock (hilarious, by the way).Ã‚Â Twenty minutes later, I came to check on them.Ã‚Â It’s about bedtime by this time.Ã‚Â I check report boy, and he’s got ONE WHOLE PARAGRAPH done, and one picture.Ã‚Â Biographer girl has finished the first chapter. I did a great job of making them both feel horribly guilty that they a-hadn’t mentioned that they had these assignments, and b-hadn’t started working on it until now.Ã‚Â I made sure that they both knew they were destined to fail their respective classes and would only be qualified to work at a gas station if they kept up this pattern of behavior.Ã‚Â Not my finest moment.Ã‚Â I went off to put the other children to bed, not knowing what to do with these two. After teeth brushing, stories and prayers with the other three, I came back to see what, if anything, I could do to help my two slackers not fail.Ã‚Â We decided to do a timeline of Houdini’s life, and I asked her to write down the important dates from his life that she had read about (birth, death, marriage, important events, etc. ).Ã‚Â She came up with about 10, and with a little help from me, we got the dates right, printed a few pictures from the old internet, and got a reasonably decent time line put together by 9:30.Ã‚Â I sent her off to bed. Galapagos boy had pulled it together and done a halfway decent report, complete with 3 or 4 pictures.Ã‚Â When I read it through, I was pretty sure that he had put it in his own words and not just done a cut and paste job from the internet.Ã‚Â (Especially the part about “these turtles are important because if they weren’t there, the sailors wouldn’t have had anything to eat”).Ã‚Â I encouraged a few changes, put new color ink in the printer so the pictures wouldn’t look all striped, made sure he had an appropriate bibliography and had covered all the points listed in the assignment sheet.Ã‚Â I gave him a folder to put it in, then told him to go to bed when he was done. I dragged myself up to bed.Ã‚Â Exhausted.Ã‚Â Feeling like a failure, myself. I know this little crisis could have been handled better, but I’m not exactly sure how.Ã‚Â I just want my kids to be successful, responsible people, and part of that is getting good grades, turning things in when they are due, and not leaving big assignments until the very last second.Ã‚Â I also don’t want to be the tyrant mother that my kids are afraid of and they don’t want to admit anything because they know their mom will jump all over them.Ã‚Â I want to be the nice, understanding mom.Ã‚Â The mom who helps them through the tough times, not the mom who yells at them for causing their own tough times.Ã‚Â I guess maybe I was a little bit of both last night. Will I get my “shop” back? A few years ago, I volunteered to “play Santa” for Ryan’s work Christmas party.Ã‚Â They had Santa come, and gave a personalized gift to each child who attended.Ã‚Â To prepare, they asked the employees to suggest a toy or let them know an interest of each child.Ã‚Â There was a $10 budget for each gift.Ã‚Â I LOVED doing this.Ã‚Â I shopped sales, did price matching, one day sales, etc.Ã‚Â And this wasn’t online shopping, either (the shipping would have eaten up my budget), it was shopping in an actual store.Ã‚Â John was a baby, and sometimes I took him and Jenna with me while the others were at school.Ã‚Â Sometimes I had a babysitter. Some of the gifts I remember were bionicles (they had a buy one get one free deal, so I stocked up on those for little boy’s gifts), furreal pets, the Dogz, Barbies,Ã‚Â and model cars.Ã‚Â The older kids were harder to shop for, especially when there was nothing listed as interests, so they got jewelry boxes, CD’s or even a gift card or two to Barnes and Noble (Cole’s favorite gift that year, I think).Ã‚Â I had so much fun shopping for other people’s kids with other people’s money.Ã‚Â I think I even told someone that I should be a “Christmas shopper” and do people’s shopping for them. How much has changed in a few short years.Ã‚Â Black Friday shopping?Ã‚Â No thanks.Ã‚Â Shop for other people who I don’t even KNOW?Ã‚Â I don’t think so.Ã‚Â Shop for needless toys for my kids that will just get broken or be the cause of fighting on Christmas day?Ã‚Â Count me out. What has happened to me?Ã‚Â I used to LOVE the thrill of Christmas shopping!Ã‚Â Finding that perfect gift was a thrill for me.Ã‚Â I still want to find the perfect gift, but I’d like to find it at 50% off with free shipping and have the nice men in brown deliver it for me. I guess my life has gotten busier in the last three years.Ã‚Â Yes, being in the bell choir and having almost every night in December be busy with rehearsals or concerts does take away that urge to shop.Ã‚Â Having kids who are also involved in choirs and bands and dance and therefore fill up every remaining available night with their concerts, recitals and rehearsals also takes the thrill out of going out there and fighting the crowds. I’m not worried.Ã‚Â I’m sure I’ll get my “shop back”.Ã‚Â Sometime.Ã‚Â But for now, I’m relieved that my presents are all bought. Really.Ã‚Â All bought.Ã‚Â And it’s not even December 1st.Ã‚Â Yay for me!Ã‚Â I’m sure I’ll find a few more last minute things and remember something that I have forgotten, but for the most part I’ve got the shopping done. Ã‚Â I’ve gotten a few things on line, and picked up a bunch of stuff early.Ã‚Â Not wrapped, yet, unfortunately.Ã‚Â I’ll work on that soon, but since I don’t yet have the tree up there would be nowhere to put those presents…yet.Ã‚Â I’m going to work on that today. But I’m happy that since Thanksgiving was so early this year, we have one more week to get ready for Christmas.Ã‚Â To do all those fun things we want to do to enjoy the season.Ã‚Â And getting the gifts done and out of the way early just frees me up to not have to worry about those details. How about you?Ã‚Â Are you a shopper? And this will be the last time I blog about Reflections. Really. Today was my awards assembly for our school’s reflections contest.Ã‚Â Hallelujah!Ã‚Â This morning I left my house at 9:00, with all the entries, awards, medals, and certificates piled in the car.Ã‚Â I dropped John off at a friends, and drove to the school.Ã‚Â Since it was icy, I had to carefully pick my way along the sidewalk from the car to the school about 5 times back and forth as I brought my many boxes of stuff into the gym.Ã‚Â As I was setting up for the 1st assembly at 9:30, I realized what I had left home.Ã‚Â The basket of candy bars.Ã‚Â EEERG.Ã‚Â The kids were promised candy bars, and if I didn’t deliver candy bars, someone might complain.Ã‚Â I called my friend, who was going to come and help me, but I only got her answering machine.Ã‚Â I tried her cell, but no answer.Ã‚Â At 9:15 I saw her walking down the hall.Ã‚Â She was a complete doll and drove to my house, and picked up the candy bars.Ã‚Â Crisis averted. At the assembly, we showed the slide show that Cole had made for me (pictures of all the entries set to music), then we showed our first place film/video winner, a darling claymation that I just love, and then handed out the awards.Ã‚Â For the lower grades that goes pretty fast, and we were done in one hour. I had set up the non winning entries on tables, so that afterward, they could just come and pick up their entry, certificate and treats.Ã‚Â But then I had kids coming saying they couldn’t find their entries, and teachers saying that they had a child in tears because they thought they had entered, but couldn’t find it.Ã‚Â One or two art entries I can understand, but 10 that we can’t find?Ã‚Â I went to go look in my car between assemblies, and found a box right outside the door full of ….you guessed it….art entries.Ã‚Â Ugh.Ã‚Â I had put that box down so that I could open the door, but then forgot to go back and get it.Ã‚Â Oh well, crisis controlled. The second assembly went well, with the kids clapping and cheering more than the little kids.Ã‚Â By the end of the slideshow, they were really cheering.Ã‚Â The words “We’d like to thank the following businesses for their generous donations” scroll by, and the cheering gets louder.Ã‚Â What?Ã‚Â Oh, I see.Ã‚Â They see the names of the businesses….Coldstone (cheering and screaming), Hale Center Theater, (crazed cheering).Ã‚Â By the time they read “Boondocks”, I think someone’s going to go home with larangitis.Ã‚Â I’m glad they were excited. After delivering a few art entries to the younger kids, cleaning up the few extra medals and certificates, and collecting all of my boxes, I’m exhausted, but very relieved.Ã‚Â Hooray, it’s over! I just have to get the entries ready to move on to the next level, but that won’t take me more than an hour (I hope). Tomorrow night we will have our celebratory reflections dinner, and use some of these free kids meals the kids won.Ã‚Â Mimi’s cafe, anyone? And right now my kids are arguing over who gets to be the baby Jesus with the newly discovered nativity scene.Ã‚Â And I wonder why we lose a piece of this nativity about every year? Oh, the relief. Oh, the joy. My husband just came home early (shock!) and surprised me with some much needed good news. a-Ryan left work early today andÃ‚Â took the van to the second repair place.Ã‚Â The first place fixed a bad injector for us, but recommended that we take it to a different place that does more electrical work to fix the horn/cruise control.Ã‚Â So, he took it to that place today, and JOy of all joys, they just hooked the little connection back up and now it works fine.Ã‚Â No Charge.Ã‚Â Did you hear that, people, NO CHARGE? !Ã‚Â After all the work we’ve had to do on cars lately, that was a such a blessing.Ã‚Â Thank you, kind repair guy. b- There was a UPS package on the porch for me containing the much anticipated reordered medal for the reflections program in two days.Ã‚Â Breathe a big sigh of relief on that one!Ã‚Â I am SO READY for this one to be over, folks.Ã‚Â I’ve already turned in my “PTA resignation”–in other words, I won’t be doing reflections again next year, thank you very much.Ã‚Â I’ve just spent WAY too many HOURS on this volunteer job.Ã‚Â I blame myself because I’m not very good at delegating (it’s too much work to explain what I want to someone else, if that makes sense).Ã‚Â But now I have the right medals, and today I called all the parents of the winners, and I am seriously ready.Ã‚Â Then hopefully I can move on to more fun things.Ã‚Â Like Christmas cards. “Didn’t you just say we were going to an indoor soccer game for FHE tonight?” he asked. “Well,Ã‚Â YOU could go to the indoor soccer game, and I could go to the concert with one of the kids!”Ã‚Â I couldn’t believe he would say no to free tickets.Ã‚Â I then had to explain to him that at any time, if someone calls and tells you you have won something, or there is a chance to win something for FREE, then the answer is Yes.Ã‚Â How long has he been married to me and he didn’t understand this? And one more unrelated thing, John wore a tie to school.Ã‚Â An orange t-shirt that says ‘polo’ on it, shorts, and a blue tie with white polka-dots on it.Ã‚Â No, I don’t know why, but when he picked out his clothes this morning, he brought down the tie and wanted to wear them.Ã‚Â Whatever.Ã‚Â I’m sure his preschool teacher got a nice chuckle from his appearance.Ã‚Â The boy won’t use the potty, but he doesn’t mind wearing a tie.Ã‚Â I will never understand him. I’m not one to actively watch an entire football game, even one as exciting and important as this one, but the score IS important to me.Ã‚Â So, to watch our Cougars pull off a nice win like this one was quite exciting at our house.Ã‚Â Ã‚Â It was pretty quiet here in the neighborhood because about half of the neighbors (and the kids’ friends) were AT the game, so there was no hollering in the street.Ã‚Â But just now I did see the pack of little neighborhood boys with their BYU shirts on walking around the circle proudly waving the BYU flag. 17-10.Ã‚Â Oh yes, Take that Ute fans. It’s 9:15 am and already we’re on our third pull-up and second tantrum of the day. And I’ve had one piece of pumpkin pie. And I’m still in my pajamas. In 1960, I woke up one morning with six hungry babies and just 75 cents in my pocket. Their father was gone. The boys ranged from 3 months to 7 years; their sister was 2. Their Dad had never been much more than a presence they feared. Whenever they heard his tires crunch on the gravel driveway they would scramble to hide under their beds. If there was a welfare system in effect in southern Indiana at that time, I certainly knew nothing about it. I scrubbed the kids until they looked brand new and then put on my best homemade dress, loaded them into the rusty old Ã¢â‚¬Ëœ51 Chevy and drove off to find a job. The seven of us went to every factory, store and restaurant in our small town. No luck. The kids stayed crammed into the car and tried to be quiet while I tried to convince whomever would listen that I was willing to learn or do anything. I had to have a job. Still no luck. The last place we went to, just a few miles out of town, was an old Root Beer Barrel drive-in that had been converted to a truck stop. It was called the Big Wheel. An old lady named Granny owned the place and she peeked out of the window from time to time at all those kids. She needed someone on the graveyard shift, 11 at night until 7 in the morning. She paid 65 cents an hour, and I could start that night. When I got home in the mornings I woke the baby-sitter up and sent her home with one dollar of my tip money Ã¢â‚¬â€ fully half of what I averaged every night. As the weeks went by, heating bills added a strain to my meager wage. The tires on the old Chevy had the consistency of penny balloons and began to leak. I had to fill them with air on the way to work and again every morning before I could go home. One bleak fall morning, I dragged myself to the car to go home and found four tires in the back seat. New tires! There was no note, no nothing, just those beautiful brand new tires. Had angels taken up residence in Indiana, I wondered? I made a deal with the local service station. In exchange for his mounting the new tires, I would clean up his office. I remember it took me a lot longer to scrub his floor than it did for him to do the tires. I was now working six nights instead of five and it still wasnÃ¢â‚¬â„¢t enough. Christmas was coming and I knew there would be no money for toys for the kids. I found a can of red paint and started repairing and painting some old toys. Then hid them in the basement so there would be something for Santa to deliver on Christmas morning. Clothes were a worry, too. I was sewing patches on top of patches on the boys pants and soon they would be too far gone to repair. On Christmas Eve the usual customers were drinking coffee in the Big Wheel. These were the truckers, Les, Frank and Jim, and a state trooper named Joe. A few musicians were hanging around after a gig at the Legion and were dropping nickels in the pinball machine. The regulars all just sat around and talked through the wee hours of the morning and then left to get home before the sun came up. When it was time for me to go home at 7 on Christmas morning, to my amazement, my old battered Chevy was filled full to the top with boxes of all shapes and sizes. I quickly opened the driverÃ¢â‚¬â„¢s side door, crawled inside and kneeled in the front facing the back seat. Reaching back, I pulled off the lid of the top box. Inside was a whole case of little blue jeans, sizes 2-10! I looked inside another box: It was full of shirts to go with the jeans. Then I peeked inside some of the other boxes. There was candy and nuts and bananas and bags of groceries. There was an enormous ham for baking, and canned vegetables and potatoes. There was pudding and Jell-O and cookies, pie filling and flour. There was a whole bag of laundry supplies and cleaning items. And there were five toy trucks and one beautiful little doll. You may know that I’m in charge of the PTA Reflections contest for our school. If you didn’t know that, well then you haven’t been paying attention around here. For the past two weeks, I’ve had 151 entries here at my house, and I’ve been in charge of getting entries judged, tally the scores, calling businesses and collecting freebies. About a week and a half ago I ordered medals. I found a company online with good prices. Plus I could order from the comfort of my own home instead of driving around town to order and pick up. Because basically I’m tired of driving all over for this PTA job. I’m getting tired of my PTA job, and maybe, just maybe a little bit burned out. What? What is gross? What’s wrong? I come to see, and I see the medals, and don’t see anything wrong. Upon closer examination, I realize that the bas relief-ness of the art medal may present a problem. I’ve tried to blow this little picture up a bit so that it’s more of it’s actual size. Do you see anything that might present a problem? It’s art, right? There’s an artist’s palette, the Parthenon, The Venus De Milo. Art things. Oh! I just realized that giving these awards, which are in 3D, may be a problem for your average 5th grade boy. Or girl. Oh, the titillation. Since this realization that this may be a big mistake hit me on Friday night, and I don’t have the phone number of the principal at home, I got to stew about it all weekend. I mean, the assembly is TUESDAY, as in Tomorrow, people. So, we get to drag this ordeal that is reflections out just a bit LONGER and have our assembly NEXT week instead. Which is fine. The only reason I scheduled it before Thanksgiving was to get it over with. I called the medal people, and yes, they can replace them with a more appropriate, although pretty generic medal. They will of course charge me a 15% restocking fee and I’ll have to pay the return shipping and more shipping on the new stuff. Ka-ching. That will eat up the extra I had in the budget, but it seems worth it, don’t you think? My supportive husband, Ryan, had really gotten a kick out of this whole thing. He laughs that I’m distributing soft p*rn to the kids at school, and suggested that he grind all the Venuses off with a grinder. Or we could draw little t-shirts on them all with a sharpie. Because that won’t draw attention to it at ALL. Ha, Ha. Really funny. My talented artist sister Amy did the artwork for Music and the Spoken word on Sunday. This is her third time in three months that they have asked her to do this, so I hope it’ll be a regular job for her. When she told me that she was doing some paintings for their Thanksgiving show, I was excited. 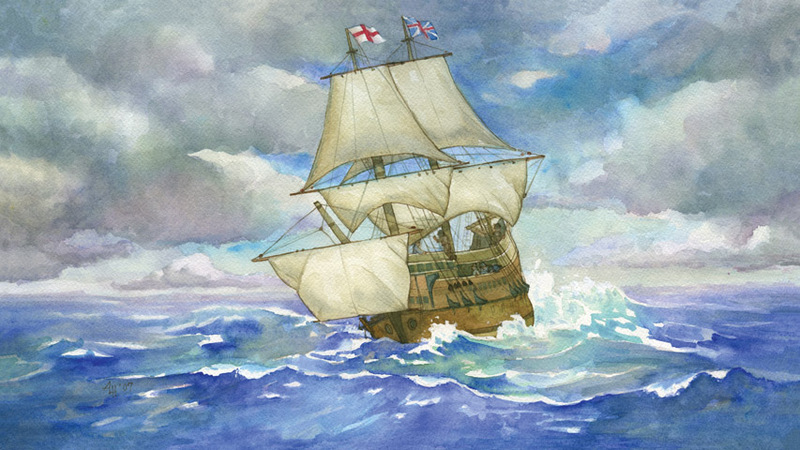 She gets to paint the Mayflower and some pilgrims reaching the country. In fact, here’s one of the paintings. It’s a guy throwing up over the side! How cool is that? She took my suggestion, and even painted it in the painting! It’s like a my own personal “Hi Paige” wave being broadcast over the tv via the Mormon Tabernacle Choir! Isn’t that great?! I was pretty impressed, that’s for sure. You can go to her site and see the other painting and the story that goes with it. So, if you didn’t catch Music and the Spoken word this morning at 9:30, then shame on you. No, just kidding. You can watch it next week on KSL at 8 am or 4, I believe, and look for the awesome illustrations, and enjoy the lovely music. When we came downstairs this morning, we found an unwelcome sight. “What’s wrong with Zuzu?” Natalie asked. I went to go and look in the bird cage, and sure enough, our little Zuzu was laying down on the bottom of the cage. Birds don’t just lie down, so we knew something was wrong. She was dead. Now, we’ve kind of been expecting old Sundance to die first, since he’s really old in bird years (he’s older than my oldest child, so he’s got to be at least 14! ), but weren’t prepared at all for the death of Zuzu. The kids were all crying, and we put her in a shoe box. (And by ‘we’, I mean Ryan, as I didn’t really want to be touching any dead things.) They were able to say goodbye to her, and we’ll have a little funeral and burial after school today. They were writing little notes and drawing pictures to put in her box with her. This is the first death we’ve had in our family, other than that silly goldfish that lasted about 3 days–we didn’t even have time to get attached to it. It’s a good thing for the kids to know that everyone eventually dies, but it’s a harsh truth. They are going to have a very sad day. So, rest in peace, Zuzu. We will miss you.